Dennis Spencer Freeman was born on August 12, 1946 in Patterson NJ. He was the first child of his late parents, John A. Pressley and Wilma L. Pressley. He was preceded in death by his daughter Sierra Shadé Freeman. Dennis was formally educated in the Newark Public School System. In July of 1964 he entered the Marine Corps. While serving in the Marine Corps he earned a National Defense Services Medal, Vietnam Service Medal and Vietnam Campaign Medal. After being discharged in 1968, Dennis attended Rutgers University in Newark NJ. While attending he met his future wife, Patricia Ann Baker, the love of his life. In 1971 Dennis began his career at NJ Bell as a Customer Representative where he worked his way through various positions and advanced to Product Manager which continued under the Bell System with AT&T. Dennis retired from AT&T after 30 years of service. Dennis was a fisherman and especially enjoyed fishing and crabbing trips with his children and grandchildren. He loved cooking, especially barbecuing. He loved playing chess, spades, playing pool and gardening. He was also a big baseball fan and his favorite team was the NY Yankees. 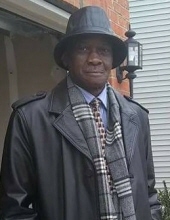 Dennis relocated to Gastonia, NC where he departed this life on March 30, 2019. He leaves to cherish in his memory: three daughters Tawania Stanford, Denise Freeman, & Keely Freeman-Smith. Siblings Teresa Sanders, Arline Fisher, Douglas Pressley and Derek Pressley. His grandchildren Antwon Freeman, Keyone Kelly-Richardson and Jerell Cohen. Great grandchildren Josiah Freeman, Amaré Freeman and Jordan Monroe. And a host of Nieces, Nephews, Cousins and Friends. This Online Memorial has been created to commemorate the life of Dennis Spencer Freeman. Leave a message on the Tribute Wall to share your favorite memories and offer words of sympathy and comfort. To send flowers or a remembrance gift to the family of Dennis Spencer Freeman, please visit our Tribute Store. "Email Address" would like to share the life celebration of Dennis Spencer Freeman. Click on the "link" to go to share a favorite memory or leave a condolence message for the family.